I’ve been observing two things (one good and one bad) being conflated into a single topic and then dismissed altogether. This is much like the proverbial baby being thrown out with the bath water and I want to take a shot at expressing my thoughts about it. In one way, I see a true principle under attack by its meaning being diluted and reassigned to something negative, the final effect being that the principle itself and it’s true meaning are frowned upon. I’m talking about the word perfection. It seems popular today to label perfection as a dirty word, and I see this everywhere. I hear it in Gospel Doctrine class, I see it on Pinterest and in Instagram posts and I’m concerned that the net effect is calling good evil. There is an example I saw recently that is actually using a quote from a general authority to make its point. This is a screenshot from my phone and while I understand the context and what this person is saying, or trying to say, I want to explain a little further by digging into where I see the problem. In this example, the person is repeating a line that is in reference to this cultural ideology, strong in Mormon culture, that you need to do all of this little things without flaw to be considered a “good Mom/Dad/Wife/Husband/Person.” It’s true that there is this unfortunate social pressure within Mormon culture where a lot seems to be expected. As a Latter-day Saint, you aren’t just an audience member, you are part of the ministry. Above just trying to live the complexities of your own life, you are managing your service in God’s work. It can be quite stressful, frustrating, and discouraging when things don’t turn out the way you think they should be. We talk a lot about these well-planned, crafty, and life-changing family home evenings we could be having, family scripture study, sharing the gospel with friends and family, home and visiting teaching, etc. It is very easy for the vicissitudes of life to throw it all into a mess and cause one to end up feeling like a total failure, especially when you have to return and report your progress in some cases! That’s where this opitate comes into play, “Relax, you don’t have to be perfect.” We tell ourselves this and it gets repeated over and over and the word “perfection” becomes the enemy and all that symbolizes unobtainable goals. “Nobody will ever be perfect in this life,” we say, and on it goes to the point where the word perfection becomes cringeworthy. I heard this comment on the same Sabbath morning that I saw that Instagram post about perfection so these thoughts were already stirring in my mind. I couldn’t let this one slide so I spoke up and did my best to try and make my case for the defense of perfection. I’m going to take the gist of what I said and expand upon it with some references. 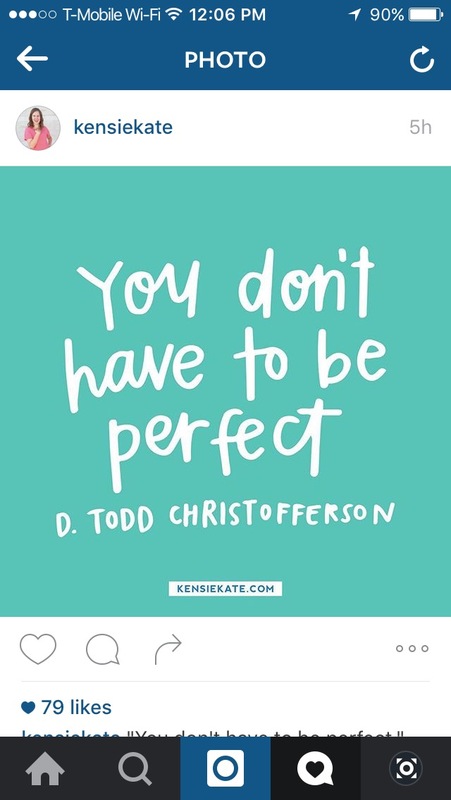 Yes, we are commanded to be perfect. Where things get further confusing for people is they are bombarded with social media memes, blog posts, and conversation that tells them they don’t have to be perfect but then scripture has another message. One of the problems we face is the clash between the language of the scriptures and modern speech. The way we use words in our everyday speech and what we understand them to mean often takes precedence over what those same words meant in the context of scripture. Most of us, including myself, are reading the scriptures in English approximations of Greek or Hebrew words that originally had their place in another culture, long ago and far away. This is something that needs to be taken very seriously because the meaning of words is critically important. If God is telling us to go right and in modern speech right means left, then we are going to have problems. The words perfect and perfection appear in the Old and New Testaments so let’s see what is behind the English and see what the Hebrew and Greek words are. “to bring to full development,” late 14c., parfiten, from perfect (adj.). Related: Perfected; perfecting. early 15c. alteration of Middle English parfit (c. 1300), from Old French parfit “finished, completed, ready” (11c. ), from Latin perfectus “completed, excellent, accomplished, exquisite,” past participle of perficere “accomplish, finish, complete,” from per- “completely” (see per) + facere “to make, do, perform” (see factitious). Often used in English as an intensive (perfect stranger, etc.). I hope that you can start to get the sense that there’s something else going on here and how far removed it is from the type of “perfection” people talk about when they are feeling guilty about not having a clean house or juggling personal and family schedules. That is not the kind of perfection that God expects from us. Keeping a clean and organized house, managing schedules, and meeting the demands of life in general is something we’re going to constantly struggle with. We’ll get it right from time to time, have some incremental progress, but then we’ll hit a whole new set of challenges. Think about how we start off knowing nothing and have to learn to walk, read, and write. We go to school and advance from grade to grade and just when we are starting to feel comfortable, we are thrown into a brand new experience while learning new things and make mistakes. Then we hit puberty and have to deal with new attractions, new feelings, and motivations that were not part of life before. We make mistakes, and then we find ourselves in adulthood where now marriage comes into play. We’ve never been married before, but now it is our reality and we make mistakes. Just when our feet are barely wet, a baby comes along and we have to learn how to fit that into everything else we have going on and we make mistakes. Then more babies come along, more new situations, and more mistakes are made. Then these kids learn to read and write, start going to school, and then into puberty. You’ve never been a married parent of a child going through puberty before and you make mistakes. Then your kids are married and you have grandkids but you’ve never had married children with grandkids before and you make mistakes. Then you look in the mirror one day and see your gray hair and wrinkled face and think of all the mistakes, successes, joys, failures, accomplishments, and tragedies that you’ve experienced. Though we age, new experiences are a constant of life. Every year that passes you enter new territory that requires you to adapt. Not only does personal life change continually, your health changes, church callings change, you move, change employment, and the world around you spins like a kaleidoscope. On top of that we add hobbies, we try to keep up with the 24/7 news cycle and lives of hundreds of people on social media, and much more. The Internet and modern communication is a blessing and a curse depending on how we use it. Instead of drinking sips, we open the floodgates and pour all this information constantly into our lives. We can’t process it all and we can’t do it all. We see the potential to do so many things but are literally incapable of doing it all. No wonder that we feel overwhelmed and inadequate. In this context, relax, take a deep breath and realize that doing every single thing in life without errors or mistakes is impossible and nobody expects that level of performance from you. Sure, we push ourselves and try to do and be better, we should do that, we should try because in that struggle we grow stronger, it’s one of the reasons we are here. It’s in the reach that we learn and grow stronger. Sometimes when we run, we trip and fall. If you are like me, you feel a tad more clumsy than others and trip and fall quite a bit. It is frustrating, but sometimes that’s just how it is and it’s ok; scars heal with time and life goes on. We are all running the race, but some of us are trying to juggle flaming chainsaws with one hand while our other hand is straining to hold boxes full of rocks while to tell everyone about it on facebook, Pinterest, Instagram, Twitter, our blog, and text messages to family and friends. Perfection isn’t the enemy, because none of this has anything to do with perfection. I’d say that many of us are suffering from overstimulation and taking on too many unimportant things, and trying to hard to impress and keep up with others instead of focusing on what really matters. In the DVD that accompanies the book Power to Become, Elder David A. Bednar uses a great analogy that relates to life. He talked about a circus performer spinning plates and noted how in order to keep all the plates up in the air, the performer had to work constantly to speed up the plates that were perpetually slowing down. In the video below you can see some plate-spinning action and pretend that it is you trying to do life (you can jump to the 2:00 mark if you are short on time). You only have two hands to do this, and the more plates you want to keep spinning the harder you have to work. Some people are good at spinning many plates, they might even enjoy it, but others find it a frustrating task to try and keep up! What plates are most important? Are we letting the truly critical plates fall because we are trying to spin so many that we can’t keep up? What kind of mania has overtaken our generation? Where is time for quiet, for meditation, pondering, and reflection? We are too distracted, and the voice of the Spirit is buried underneath crashing waves of noise. We are thirsty because instead of going where the living water is, we chase mirages. God expects us to be perfect, but what he means by that is something entirely different from what today’s world gets. The scriptures talk about being perfect and so should we, but we should talk about it in the context of what it truly means and use the incredible blessing of resources around us to frame God’s eternal goals into something we can understand and benefit from in the here and now. Note that I’ve underlined the word in that is found in the second verse. What does it mean to be perfect (or “complete”) in Christ? This is an important question because it gets at the heart of the kind of perfection that God desires for us. Volumes can be written on this and I don’t think it is necessary to add more complexity to something so simple. It seems that many feel that the path to perfection means adding all of these new skills and abilities that are extremely difficult to acquire. Note Moroni’s words again, he emphasizes repentance, denying yourself of ungodliness, and loving God. Loving God isn’t done in isolation, it is in conjunction with loving one’s neighbor. When perfect in Christ, you know that you are redeemed, that you are accepted by God and that the course you are pursuing in life is in accord with his will. To be perfect in Christ is to be born again, complete because of him. This kind of person is not free from mistakes, but knowing their salvation is sure, they press forward through thick or thin with a perfect brightness of hope and Love of God and of all men. This is not because they feel obligated or driven by fear to do these things, it is because their exposure to the Love of God has changed their disposition. I may not use the greatest words to express such wonderful things, but I have experienced them for myself. You will find a path that leads to these things if you pursue it with a pure heart, unwavering desire, and real intent. The scriptures teach these things and they are indeed true and wonderful, rich and satisfying, both living water and a burning fire. If we have no experience with the perfection that God desires for us, then we sit with an empty plate at the greatest feast the world has ever known. Steve, I really liked the way you laid this out. I thought that it is pertinent to add one aspect of perfection. James 2:10 – “For whosoever shall keep the whole law, and yet offend in one point, he is guilty of all.” It seems like a harsh scripture, but I I recently read an awesome book that explains it a little better. There is a running theme in the scriptures, “Wherefore teach it unto your children, that all men, everywhere, must repent, or they can in nowise inherit the kingdom of God, for NO UNCLEAN thing can dwell there, or dwell in his presence…” (Moses 6:57 emphasis capitalized). When I was younger this made no sense to me. I thought that if it was only one sin, or one uncleanliness that caused my exclusion God would be unjust. How could God exclude me for my one sin? How could he expect me to live up to such an impossible standard. We are expected to be perfect, but the process is very different than what most of us think. Many think, well, I am going to have to work harder and do more so I can be perfect. I am am going make myself perfect. Very much along the lines that you spoke of above. As you have described, that is not the perfection required, but more importantly, we are not expected to do it alone. That is where the Grace of Christ comes in, and His grace truly is sufficient for us, as He wrought an infinite Atonement for us. We are to be perfect, but that perfection will not come on our own power or our own willpower. The odd thing is we are perfected as we give up our will to Christ. We are perfected as we allow Him to change and mold us as He needs. This sanctification and purification is ultimately a product of giving up our will and allowing it to be caught up by Christ. Then, as you demonstrated, we will be made perfect in Him. For a long time, I had no concept of this perfection in Christ and sanctification. I did not understand grace, and thereby, I did not understand the Atonement. I tried to come to Christ, but it was haphazardly done because I held on to my pride and my will and did not allow the Atonement of Christ to work in me. Pride is still there and trying to halt my trek towards this ultimate goal of being made perfect, but someday, I will make it. I am slowly trying to eschew pride and pursue a course that is in accordance to his will, that I may be perfected in Him through His Grace. My faith is that someday I will be made clean, spotless, and perfect and be able to return to the presence of God. I believe it is possible to keep the law and remain without sin, when one has a perfect view of the law. This view comes little by little as one is sanctified. It has to be possible to keep the law, otherwise it would be unjust to punish it for not keeping it. If a Christian doesn’t believe in perfection, then they do not understand the teachings of Christ or the atonement. Christ came to bring perfection to mankind, nothing less. It is true that this is completely and totally a gift from God, 100% of it, like the sunlight and the air. We must breathe it in though, we must open our eyes, otherwise we go blind and suffocate. A gift is given, but it must be received as well. Anyway, the scriptures teach it all, it’s all there to get you started and the rest comes from God.